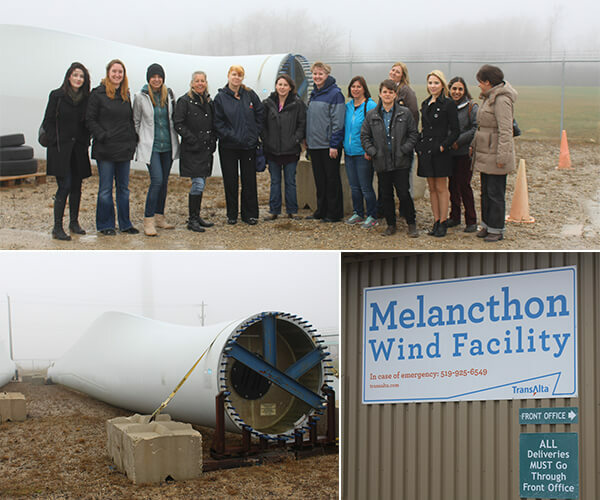 Earlier this week I joined Women in Renewable Energy (WiRE) on an educational field trip to the townships of Amaranth and Melancthon, outside of Shelburne, Ontario, to visit the Melancthon Wind Facility. Operated by TransAlta, this 200-megawatt (MW) wind farm is composed of one hundred and thirty-three 80-metre 1.5 MW GE turbines. To sum it up, for wind asset operators like TransAlta, O&M innovations would be highly welcomed. The company would like to operate more cheaply and efficiently—and really, who wouldn’t? Today’s wind turbines are filled with sensors. Anemometers and weather sensors are attached to the nacelle (the structure housing all of the generating components of the turbine), enabling the collection of met data (meteorological data). These sensors, in collaboration with the fibre optic network that connect turbines in a web and the software that provides analytics, enables the turbines to collect data and trouble-shoot themselves. Enhanced communications, software and analytics allow for less hands-on reporting; for example, Scott no longer has to submit hourly weather reports to the Independent Electricity System Operator (can you imagine the pain?). In terms of wind farm optimization, the turbines can now sense freezing rain and turn down automatically, and they can be restarted from a facility far from the farm itself. This automation can save wind farm operators a lot of money by both preventing damage and avoiding the costs of having an employee get out to the site to check a problem or restart turbines. Today much of the problem-solving and restarting can be done from a computer. These smart turbines also enable more accurate forecasting, which allows for greater wind integration into the grid. It’s normal for grid operators like the IESO to manage variability, but when you get to larger amounts of wind power the ability to forecast becomes crucial, as more accurate forecasting allows for less standby generation, which in Ontario can be hydro, but may also be natural gas. Holding less fossil fuel generation in reserve is a pretty cheap and clean way of integrating renewable resources. Of course, demand response and energy storage are additional options for integrating renewables. There are options available to reduce capital and O&M costs. According to Manitoba Hydro, approximately 75% of the capital cost of a wind turbine is related to structure. This includes the turbine’s blades, generator and tower components. Turbines are getting bigger: the larger the blades and rotor, the greater the turbine power output. However, this also means greater stress on the turbine’s gearbox, increasing damage and noise. Going gearless can reduce noise and avoid the maintenance and capital costs related to gearbox stress. Manitoba Hydro found that gearbox failures account for about 7% of all component-related failures. According to research and advisory firm Gartner Inc., wind turbine capacity has grown from 50-kilowatt units to as much as 6-MW units over the last 20 years, while the cost has dropped 80%. Wind energy is the fastest growing energy technology in the world, with a 20% annual growth rate over the past five years. The cost of wind generation is still higher than some conventional generation sources; however, these costs are trending down, while conventional generation costs are trending up (see Manitoba Hydro’s table). Ontario leads Canada in wind generation installed. The IESO has 1,700 MW of wind connected to its territory. The Canadian Wind Energy Association puts installed capacity in Ontario closer to 2,470 MW of wind. We can also expect about 300 MW of wind to be procured in 2014 and 2015, with this number representing the figures put forward in Ontario’s Long-Term Energy Plan, plus further amounts from 2016 onward. With continued innovation and incorporated intelligence, as well as the inclusion of lessons learned in the field and continued cost decline, wind is looking up. The guys (those working in wind energy most often are men) come from mechanical, electrical, software and transmission (wires) backgrounds. They are tradespeople. However, the message we got from Scott was that women are welcome. TransAlta goes to job fairs to try to promote the field to girls. The trades are heavily composed of men, but they don’t have to be. The Association of Canadian Community Colleges offers a fact sheet identifying the colleges and programs that train for the emerging renewable energy sector: women are welcome.